I am not a sadist dad. I don't push Albany to learn. In fact, I often felt guilty for not putting enough effort to educate Albany. I always thought my wife was doing a great job reading to Albany every night. As a result, she seemed to develop an interest in reading and that helped in her early speech development. Since my wife is the smarter as well as more eloquent person between us, I thought I had little to offer in terms of learning. Moreover, Albany seemed to see me as as the ultimate play mate, only going wild and loud my presence, thus might not regard me as a serious mentor. I couldn't be more wrong, of course. As time went by, I noticed Albany had the knack of emulating me very quickly. That was how she talked with a 'lah!' at the end of the sentence. Oops. Once, I was alone with Albany, driving on a highway towards home. She was crying loudly at the back of the car. I could never tolerate loud noises but there was nothing much I could do in that situation. So I sang a Chinese nursery rhyme <>, that we learnt when we were kids. Gradually, Albany stopped crying and began to giggle at my comical version of the song. We reached home safety and I forgot about the incident. A few days later, I heard Albany singing s song. Her pronunciation of the Chinese lyrics were ambiguous but the tune was clearly the same song. That was when I realised I command a heavier influence over Albany than I could imagine. As a fine eater, Albany loved both her food and treats. A few weeks ago, I decided to push it a bit by denying her of treats unless she worked for it. 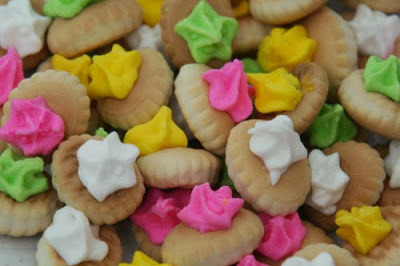 So I bought a pack of sugary biscuits that kids of my generation enjoyed in the oriental shop. Jen took the wheel that afternoon and I sat myself at the back of Ugly Green with Albany. She eyed on the biscuits curiously, unsure if those were her cup of tea. So I offered her one and it worked its magic as expected. Soon enough, she asked for the second helping. "No!" I told her firmly. I continued hastily before she could protest, "Which colour do you want, Albany?" I took out a piece with a green icing top and challenged her, "You have to spell GREEN for daddy before you can have this." She looked at me helplessly. "Repeat after me," I said. "G."
"Now try to spell green yourself." "All but her third attempt failed. "G-R-E-E-N, Green!" All three of us applauded Albany for spelling her first word. 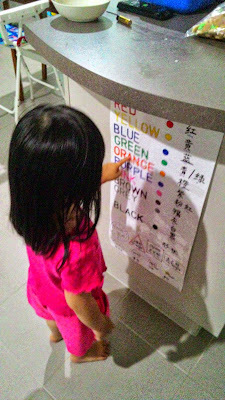 Using the same method, she managed to learn how to spell the colours pink and red over the weekend before she turns 3 this month. I would take the opportunity to challenge her whenever I could. For example, getting her to spell "Round" when she asked for a small piece of chocolate raisin (instead of chocolate, which may be too difficult for her). On a few occasions, she got impatient, yelled and refused to spell. We firmly denied her of the treat for failing the challenge and being rude. Eventually Albany got smart and stuck to what she knew and kept asking for red multi-vitamins. I quietly gave in to her, knowing that there was only 3 more red ones left in the jar. Soon enough she would have to attempt "Orange" and "Yellow"
To assist Albany to understand what she was learning was relevant stuff and not yet another meaningless thing her dad thought out, I showed her one of the old charts Jen handmade for Albany a year back and pointed to her what she had learnt so far. Her eyes lit up upon realisation all these were around her all the time. "You can learn these when you are free, Albany, because there will be no more red ones left for you soon." Albany laughed and skipped around the place. I had no idea if she understood what I meant but soon, she definitely would. This post was first published over at the blog of asingaporeanson on 7 January 2015. It is reproduced with permission.